World Wide Waftage - Wafting Through Our World Wide Travels with Ease, Joy and Simplicity: Changes over the remaining 10 days in Sumbersari…Can YOU do this? Changes over the remaining 10 days in Sumbersari…Can YOU do this? Handmade fishing boats made of plastic tubing. Everyone in the family gets involved in fishing including the youngest family members. With the owners arrival at their villa next door and their use of the Internet we no longer have the mediocre Wi-Fi signal we’ve had over these past many months. We’re down to almost no signal at all. I can’t open my email or prepare today’s post using the usual online Blogger app. Instead, at the moment, I’m writing in Live Writer, an offline program that enables me to prepare the post minus photos to upload at a later time when we can get a signal if the owners aren’t online. The system at these two houses isn’t suitable for both houses to be online simultaneously. We’ll just have to live with it for the next 10 days. Hopefully, over this period, until our departure from the villa we’ll manage to upload a post each day. If you don’t see a post on a certain day, please know we’re trying and will be back online as quickly as possible. This guy was standing on the beach with a camera waiting the motorcycle club to drive by. Once I’m done posting each day, I don’t mind being offline. I have plenty of books to read and mindless drivel type games to play on my computer and phone. For Tom, who can easily spend an entire day online, minus walks, talks, pool time and dining, it‘s all the more frustrating. Tom had hoped to call his brother Jerome today on his 88th birthday but Skype won’t be working with this poor signal. Also, we’d hoped to stream the third presidential debate tomorrow morning but that too, may not be possible. Posting photos will be especially tricky. We’ll do our best hoping to share new photos we’ve been saving for these last days at the villa. Its hard not to find myself in a mindset where I have little interest in taking more photos when the prospects of being able to upload them is minimal. The photographer crouched down when he realized the bikers were approaching. Our use of the Internet is such a vital element as we travel the world sharing stories and photos each day. Its unlikely we’d be traveling as we are if it weren’t for the availability of the Internet. It would be too difficult to plan to travel and live in so many locations utilizing various means of transportation from one country to another. Undoubtedly, we’re sensitive to the fact that many don’t have electricity or running water, many right here in this little village walking distance from the villa. And, our hearts go out to them as we fully appreciate how well they’re managed to thrive without such modern conveniences. A group stopped to help when one of the bikers motorbikes quit working. As “they” say, everything is relative. Many of us have been blessed with power and water all of our lives. Based on this fact, does that make us spoiled and uncompromising? Not necessarily. We’re all products of our environment. It doesn’t make us any less the people that we are by having been fortunate enough to have access to modern technology. That doesn’t have a bearing on the empathy we feel for others less fortunate who may never have a cell phone, a computer or a TV. We can admire them for their fortitude in functioning well in a world where they may feel deprived. In some of the more remote locations throughout the world they may have no concept of what they’re missing. In my humble opinion, none of this requires us to feel ashamed or guilty for what we have, nor do we feel less compassion for those who do not. Its the nature of the world we live in. In no time at all, they make the repairs and the biker was on his way. Am I attempting to justify our “need” for a good Wi-Fi connection. Perhaps, yes. Many who do not know or understand our lifestyle would say we’re living an seemingly easy and affluent life of world travel. We don’t believe nor have we ever intended to ever make this life on the move appear easy. Its not. Its required an enormous sacrifice that few would undertake even if it were affordable. As for affluent? That’s not us. We pinch every last penny, diligently keeping track of everything we spend and how much we can spend in the future totally determined by our income. Sure, most retirees on social security only, paying for insurance required by Medicare and health care needs, cannot do what we’re doing. It is only through Tom’s 42 years of working on the railroad, saving chunks of money along the way, that has made this possible for us. Add the reality of our careful planning, constant negotiations for better pricing and refusal to spend endless sums on dining out, partaking in pricey tourist attractions and drinking alcohol at home, that makes this possible. This may be this baby buffalo's first walk on the beach. Cooking all of our meals, two to three days at a time, saves us huge amounts on groceries. Not paying utilities, cable bills, phone bills, car payments, car and home insurance, property tax and household maintenance has an enormous impact on our ability to travel. There are locations throughout the world where those who’d like to travel may do so for half as much as we spend, opening up possibilities that may be suitable within their means. But, for those at retirement age or with families, its a difficult proposition requiring all the more planning and diligence. We’ve read numerous stories where expats live in Ecuador, for example, for under IDR 19,537,483, US $1500 a month including rent, utilities, groceries, medical and transportation. If a traveler is young and fit backpacking and living in hostels may work, occasionally working at odd jobs, living for even less than the above example is possible. Those of us who aren’t affluent must ask themselves this question, “What am I willing to sacrifice to live such a life?” For many, its not even a remote possibility, or even of interest. Coconut palms growing from abandoned coconuts. We spend the majority of our days in outrageous heat and humidity; living with insects often crawling on us (I found a slew of ants on my toothbrush a few mornings ago); having no TV in our language or no TV at all; missing family and friends; no access to good medical or dental care; limited availability of foods we like and can eat; a possibility of an uncomfortable bed or furniture every few weeks or months, and never having anything we can all our own other than that which is contained in a few pieces of luggage. Its not easy. Then, why do we do it? Because we love the adventure. Because we love the sense of freedom. Because we love the culture, the local people, the vegetation, the scenery, and the wildlife. Because somehow we fit in, we’re accepted. If something isn’t working, we discuss it, analyzing our options, discussing it with a positive attitude to those who may be able to assist. But, the most important aspect for us living this peculiar life is simple…don’t complain…not to staff, not to locals, not to people we meet along the way, not to property owners or managers, not to shopkeepers and service providers and…above all, not to one another. And so, we have lousy Internet? We live with it. We find other ways to entertain ourselves while hoping for a moment when we can get online, upload a post, say hello to family and friends and hopefully stream a show; the debate (tomorrow) and the Minnesota Vikings game (next Monday). One year ago, we posted this story. The gentleman on the front right is Tom's brother, Jerome who celebrates his 88th birthday today. He's blind and each day, Tom removes all the photos from our posts and send Jerome only the text which he "hears" on his computer. Tom's mother, shown in front row center, wrote a book, "Memories of Muggs," of the family's history. On the date of the "book signing" the family got together to celebrate the special occasion. This family photo was taken in 1997 of Tom, his mother Mary and his siblings. 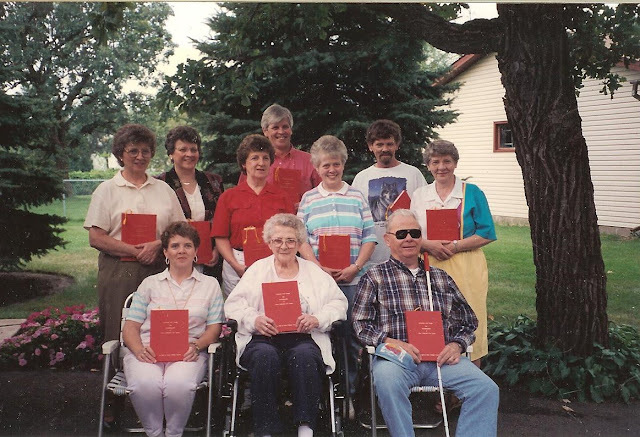 From left to right front, seated: Rita, Mary, Jerome; middle row: Mary Ellen, Margie, Patty and Sister Beth. Back row includes Colleen, Tom and Jim. The book is listed at the Minnesota Historical Society. For the rest of this story, please click here.